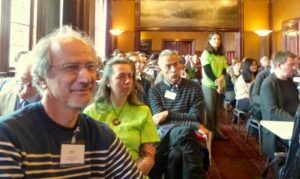 Following the closing of Evo*, the first SPECIES Annual General Meeting was held in Amsterdam on April 21st 2017, with attendance by over 50 people. The main outcome of the meeting was the election of the new Executive Board members. Marc Schoenauer, Anna Esparcia-Alcázar and Wolfgang Banzhaf renewed their positions as President, Secretary and Treasurer, respectively and five new board members were chosen including Ernesto Costa, José Ignacio (Iñaki) Hidalgo, Penousal Machado, Gabriela Ochoa and Neil Urqhuart.